KMZ, Zenit-B, 35mm SLR. Photograph gallery. 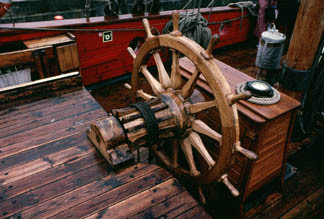 The main ships wheel of the Shtandard (Flag), a Russian replica of Peter the Great's flagship, taken at the Festival of the Sea - Portsmouth 2001, although the ship's home port is St Petersburg . The replica is a little tatty, which I think adds a feel of authenticity to it, the sails are wonderfully grimy. It was a stark contrast to the ludicrously manicured replicas around it. I heard people talking about it rather disdainfully, but I like it this way - I'm certain this is rather more representative than some of her western counterparts. 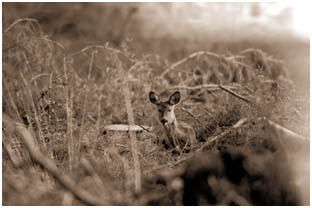 March 2004, for no particular reason I decided to take a roll of time expired TN400 up the local woods to see if I could get some deer on film. Something I have tried before and always with absolute failure. When I go without a camera they fairly well dance around right in front of me, as soon as they see you carrying anything resembling a camera - especially with a big long telephoto lens attached...they vanish. There was no special reason to match up the Zenit B with the Zeiss 500mm other than I thought it deserved another outing. The sun was very low and the lighting was harsh, but the colours were a brilliant orange wash over the whole scene. The shutter speed was a ludicrous 30th sec with the lens wide open at f/5.6, so not surprisingly camera shake is present! 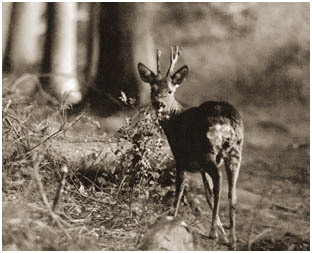 Another picture from the same deer stalking session, remembering how these little deer looked in the setting sun makes me determined to go out with a roll of colour stock next time. The far from silent shutter on the Zenit seemed to be a source of interest to these chaps...who seemed generally calm provided I kept my distance.